Described by Le Monde as ‘As fine an actor as she is a singer,’ soprano Sarah Gabriel has performed operatic roles from Handel and Mozart to Benjamin Britten, and many contemporary new works. 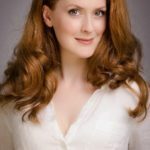 She has given recitals of music spanning 300 years at Wigmore Hall, Glyndebourne, Leeds, Dartington and Cheltenham International Festivals and has broadcast for BBC2, BBC Radio 3, 4 and 6, NPR (USA), RTÉ, France Musique, and Radio France. With Sphinx Theatre Company, she has performed Berlin Kabaret at the Young Vic, National Theatre (Temporary Space) and Brighton Fringe. Other Brecht projects include opening the Club Inégales 2018/19 London season. Projects for the 2018/2019 season include her solo show, Dorothy Parker Takes a Trip (Oxford Playhouse), The Trial of Artemisia – the new solo opera with Joseph Atkins, as well as their new show Fly Me to the Moon celebrating the 50th anniversary of the moon landing with Lucy Hawking, a new album and national tour with Air Loom, and commissioning and singing The London Songbook (14 new songs by 14 composers).